The big selling point to me was the Woodmaster’s width. A lot of small shops have 12” planers. If you’re making furniture, that’s OK but what we’re offering is wide boards including two-foot wide slabs and more. People use the bigger slabs to make bar and counter tops and I can plane them smooth a lot easier than customers can sand them. That’s just one example of how Woodmaster adds value. Some people want wood right off our sawmill. Others have us plane it for them – one side or both sides. 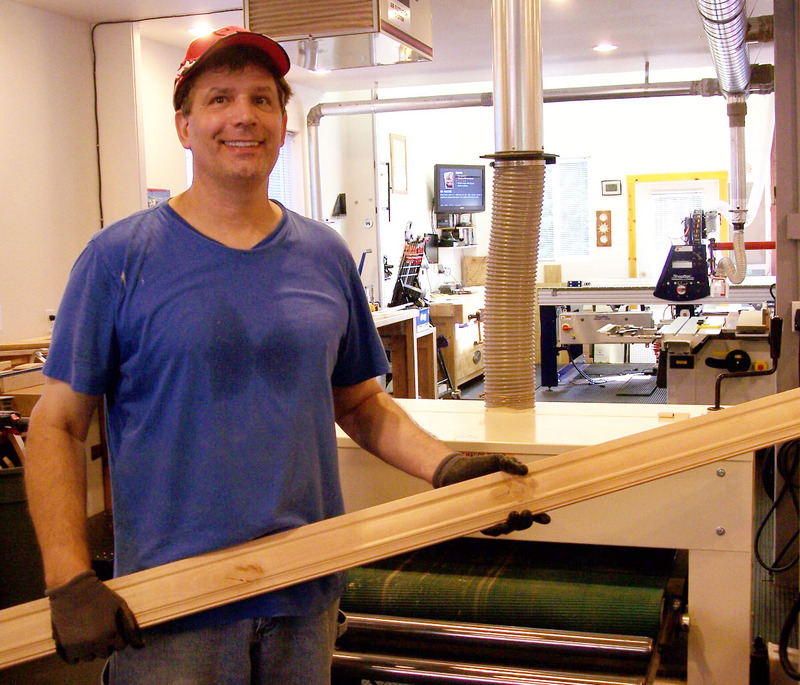 We can plane it, rip it, turn it into molding without the wood leaving our shop. This lets us sell into many niche markets very easily. 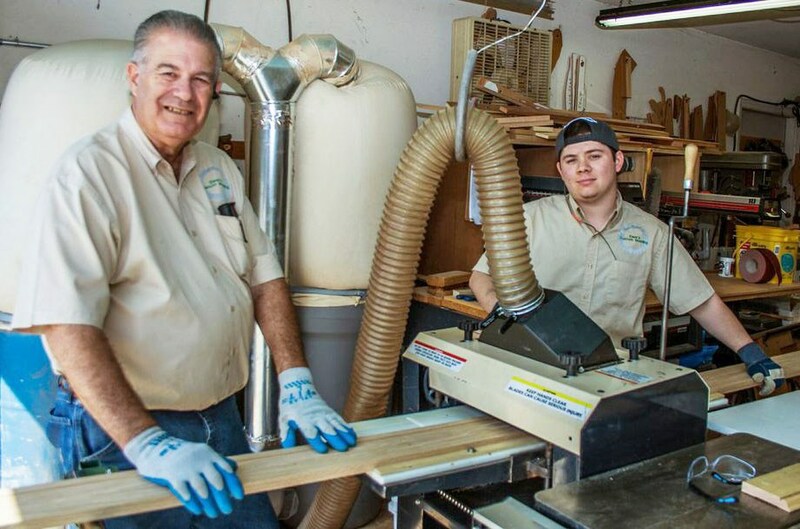 Our customers are furniture makers, lathe turners, craftsmen, do-it-yourselfers, builders, contractors, and more. There’s a lot to learn in this business but if you roll all the niche markets together, you’ve created a very successful business. I’ve dabbled in woodworking for years but I got real serious a few years ago and I decided to build a lodge style timber frame home. It’s pretty rustic with a lot of natural wood and stone. All the trim is knotty alder, all stain grade. You can’t go down to Home Depot and buy the type of building material I’m making with my Woodmasters. I bought your biggest machines, your 25” Woodmaster 725 Molder/Planer and your Woodmaster 5075 Drum Sander. Your sander saves so much time! I run whole doors through it. I had an orbital sander and a hand-held belt sander but your drum sander is so great because you just put wood through it and you’re done. They’re built like tanks, like American equipment built in the 1940’s. They’re built really well. Using my Woodmaster Molder/Planer, I make a lot of picture frames, blanket boxes, jewelry boxes, chess sets, and more. We built our own house in 2000 and I made a lot of molding for it. Having a 25” wide molder/planer is a big advantage. I’ve got a 14” imported planer and it doesn’t come anywhere near doing what the Woodmaster does. If somebody’s thinking about getting a Woodmaster, I’d say go for it. Don’t have second thoughts. It’s made in America, it does the job it’s supposed to, just like Woodmaster says it will. It’s easy to set up and easy to operate. 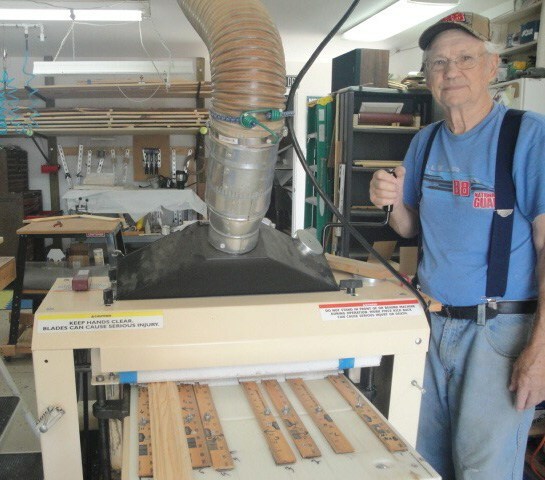 Expert woodworker and author Paul Mayer gives Woodmaster 718 his stamp of approval. Click HERE to read his review and see his video of changeover to spiral cutterhead. Why did I choose the Woodmaster? It’s big, heavy duty, fast and easy to set up. I have two 25” 725 Woodmasters, both set up as molding machines because I make a lot of door and window trim, baseboard, and more. My 18” 718 Woodmaster is set up as a planer. I don’t know any company that’s making a better machine. It’s very heavy duty and mine have lasted a long, long time. In 20 years of use, I’ve put literally miles and miles of hardwood through them. Woodmaster’s an excellent product, I’m very happy with it. I’ve used it about six years now and it’s got the original motor and still has the original rollers. I put about 30,000 – 40,000 board feet through it every year and I’ve only replaced a couple belts. The Woodmaster adds great value. To sell slabs like I’m selling, you’ve got to have a perfect, flat, planed surface to let people see the grain. That’s what adds value. Nobody wants to buy un-planed slabs for furniture-making. Woodmaster’s not a huge amount of money to put down. A lot of machines are $20,000 and $30,000. This is a machine that’s very affordable. 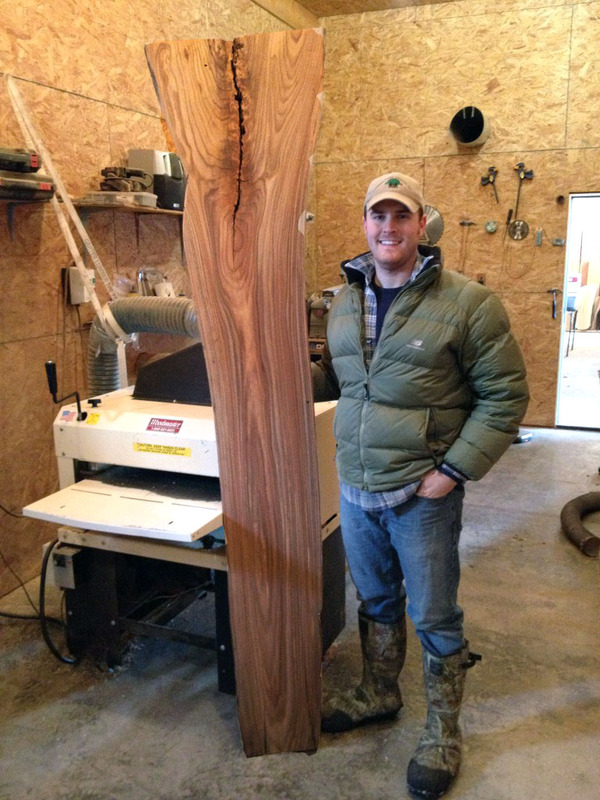 Grizzly’s got a 25” planer for $10,000. Woodmaster’s is around $2,500 or so. I can literally buy four Woodmasters for the price of one Grizzly. I’d recommend Woodmaster any day over a Grizzly. This is Todd and Tim James writing. We’re twin brothers. We purchased a Woodmaster from you two years ago. 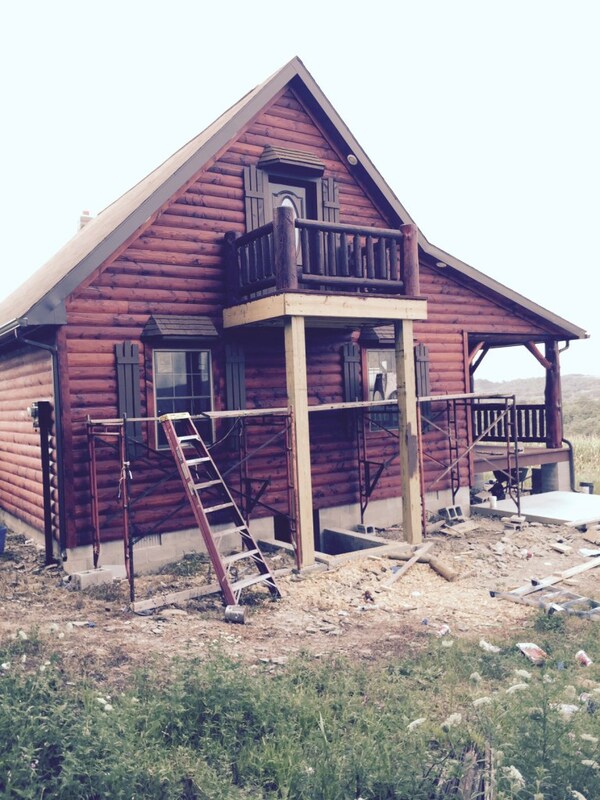 We started a project building a log cabin two years ago. Everything you see in the pictures was done with our Woodmaster. We build cottages, tables, benches, log beds, kids’ playhouses, tongue and groove boards, log siding, wood trim, hardwood flooring, and more. Our Woodmaster has paid for itself and we’ve done a lot of log siding for customers. We love it and have had a lot of success with it. We like doing woodworking and we’ve run a lot of wood through this machine! A while ago, I had a jointer I was selling. The guy who came to buy it looked at all my equipment and said, ‘If you had a Woodmaster, you could get rid of half the equipment in your shop. And you won’t need that router anymore.’ I said, ‘You mean this machine?’ and I pulled out a Woodmaster brochure I’d sent for months earlier. Turns out he was right. I got a Woodmaster and sold my router and router table. I’ve got a real production operation in my shop. I buy rough-cut wood right from the mill. I plane boards from 1” thick down to 3/4” on my Woodmaster. Then I use Woodmaster’s Gang Rip Saw to cut the planed board into blanks of whatever width I want. Then I put the blanks through the Woodmaster set up as a molder. From there, it’s right to my chop saw to cut the 45-degree angles, and I put it all together. It’s perfect. It’s the best thing I ever invested in. Before I bought my Woodmaster, I didn’t understand how useful it is, how good something like that could be. It makes all the work I do about 90% easier and makes the quality 100% better than what I was doing before. Rough-cut boards are about $2 a board foot. I turn them into molding with my Woodmaster and charge $3 a board foot. Of course, molding’s sold by the lineal foot so I convert lineal feet back into board feet and add a dollar per board foot. Business is very busy and I want to expand my shop. I got the Woodmaster first, then I bought the Pro Pack to go with it. Then I started making molding. I’m looking at a 2,400 sq. ft. shop space now. I want to get into curved molding because it’s exciting and interesting to make. And there’s good money in it. I expect it’ll double or triple my business. I really like the Woodmaster. First, it’s American made. Second, there are no plastic parts — it’s all metal. Third, the Woodmaster holds up. They’re built to last and you just don’t find that any more. 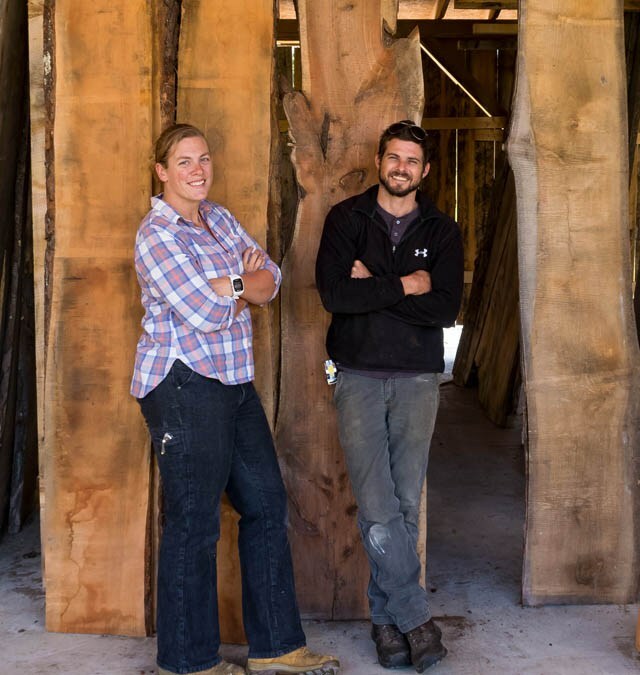 I turn the slabs into one-of-a-kind, high end furniture. For example, my Russian Olive coffee tables sell for $800 to $1,200. 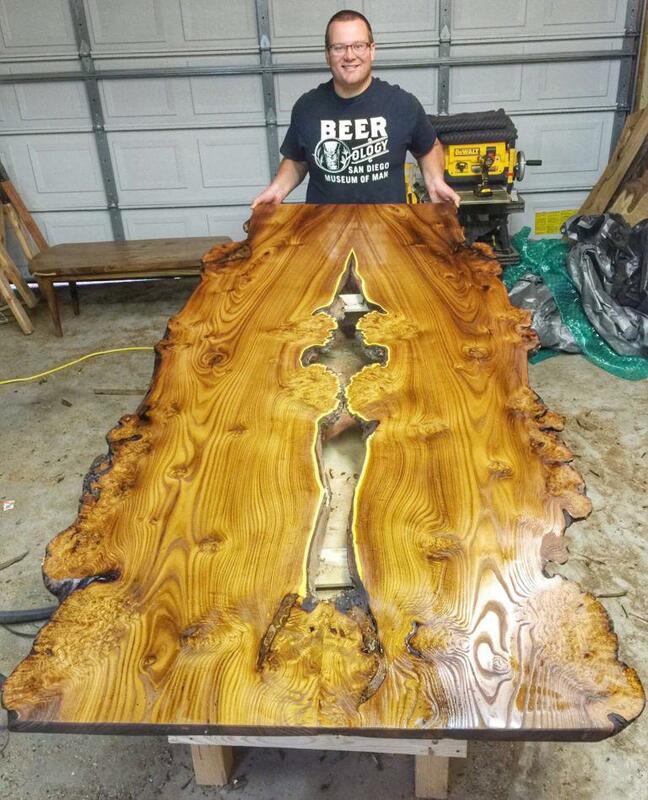 My dining tables are $2,000 to $6,000. And I’m booked with commission work for eight months! 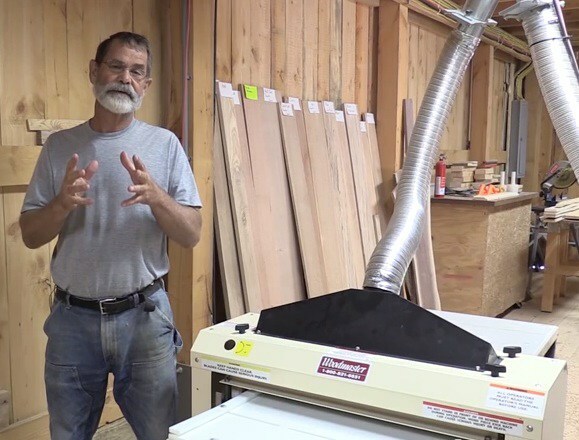 Woodmaster has the only 50” drum sander out there. I read about it online and saw good reviews. While I was searching for a wide belt, somebody mentioned Woodmaster and I got on the site. I read up and everything made sense — 50” with single phase power. Compared to the 14” benchtop planer we’ve used, this is much more powerful and cuts cleaner. We use it a lot making countertops, trim, and custom work. We’ve really put it to the test and it’s just awesome. We love the spiral cutter head! It cuts very smooth and clean. Depending on the wood you’re surfacing, it leaves it quite smooth. I take off 1/16 to 1/8 of an inch per pass and it’s fine. It’s smooth and quiet. I just ran two 14’ pieces of red oak and barely had to sand afterwards. I’ve put over 6,000 board feet through the machine in the last four years. If you’re thinking about getting a Woodmaster, buy it! Don’t be afraid to invest in something like that for your business. But don’t buy something cheap — you’ll replace it 10 times. Buy quality and it’ll stand the test of time. 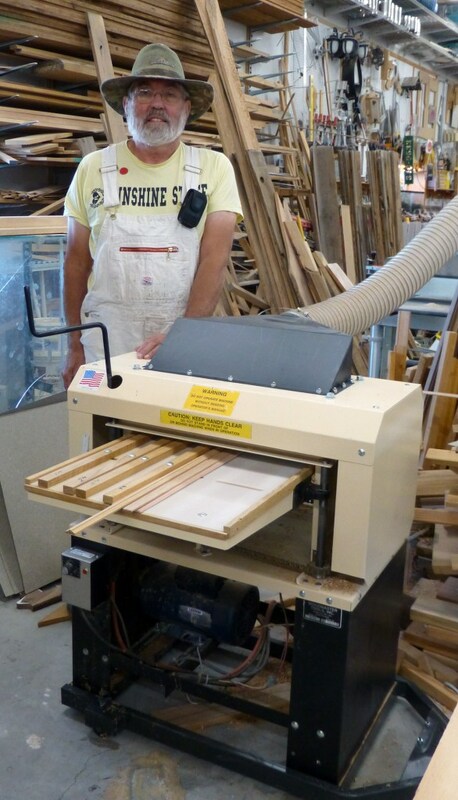 Man-hours are a big deal in business and the Woodmaster is really a time saving machine. You sure don’t want to spend hours doing something with a poorly made machine.